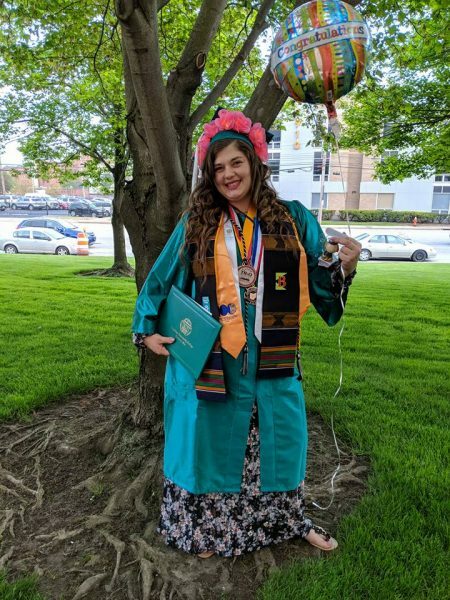 Kimberly Armbruster graduated from Cuyahoga Community College (Tri-C) this past spring, and matriculated to CWRU this summer as part of the CHC’s third cohort; she is majoring in women’s and gender studies, and plans on minoring in social justice or sociology. She first heard about the Cleveland Humanities Collaborative from the Jack, Joseph and Morton Mandel Humanities Center at Tri-C, and she thought it would be a great opportunity to further her education so that she could better help others. While at Tri-C, she was the president of the Phi Theta Kappa Honor Society and a member of the All-Ohio Community Academic Team. When asked about what drew her to women’s and gender studies, Kim said she loves how broad the scope of the field is; she can apply the knowledge she learns to a wide variety of different scenarios. Looking at the world through the lens of gender, Kim says, can help people find possible solutions to all sorts of problems related to poverty and other systemic issues. A major in women’s and gender studies, she says, will allow her to find new ways to carry out her passion for social justice and develop skills to be a voice for her community. Kim has an avid passion for learning and social activism. She says when she isn’t in class, she enjoys attending cocurricular activities like conferences so that she can continue to broaden her understand about subjects that interest her. In the past, she has also worked with a group called Empowering Youth, Exploring Justice that aims to empower middle schoolers to rise above whatever environmental hurdles they may face. She says she got involved in this group to set a good example for middle schoolers and share her own story, so that they can see the tangible ways that they can break through whatever societal barriers may keep them in place. When Kim isn’t in the classroom, she said she enjoys going to Edgewater Park; it is her favorite place in Cleveland to visit, relax, and think. In the future, Kim knows she wants to continue to help others. She is a person motivated by activism who wants to be a “catalyst for change” and wants to actively “break the chains that are holding people in place.” She thinks she may want to work for (or run!) a nonprofit so that she can continue to help the community.